A brief lapse in Google's service left crippled worldwide traffic. Google is pretty big. In fact, in terms of the internet as a whole Google is pretty well Kaiju-sized. So large is the internet titan that when it went down for mere minutes on Friday, a whopping 40 percent of worldwide traffic went down with it. 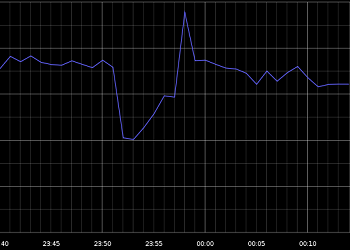 The Google outage began at 4:37 Pacific Time and, by most estimates, lasted anywhere from one to five minutes. During that brief period countless service under the Google umbrella were unavailable. This would include, of course, things like YouTube, Gmail, Google Drive and even the Google search engine, among many others. Currently, there's no explanation for what happened to bring Google down, but the consequences of its collapse, even temporary, are somewhat startling when you consider the sheer breadth of it and the possibility of it someday happening again. After all, yesterday's outage was, by most accounts, only a few minutes long. What would happen if it were an hour? Or a day? Even just personally, when I consider everything I have wrapped up in Google, the thought of it all suddenly not being there for my easy access makes me sweat a bit. But then that's also arguably one of the risks we take with the further digitization of our world. It may be more convenient to be able to access something with the push of a button, but at the end of the day technology can fail and systems can crash. Convenience comes with a cost, and for two minutes yesterday the world got a brief glimpse into what the cost of Google could potentially be.